If you’ve ever watched a myWindow segment, you’ve probably noticed the reporting team isn’t simply sitting behind a desk. They’re exploring Central Oregon and bringing the audience along. Whether John Hammarley is learning to flip his kayak, Mackenzie Wilson is giving paragliding a shot, or Kerri Stewart is getting fashion tips from local pros, each episode explores a different adventure and topic with the myWindow team. But what the audience sees is the easy part – a well-produced, engaging news segment. The weekly editorial meetings, the interviews, the scheduling, the filming, the planning and the brainstorming is what most don’t see. John Hammarley, feature reporter for Zolo Media, said the process from conception to finished story usually takes about three to four days for myWindow segments. But time is not always a luxury. If that means he has to turn a story around in a day, he can do it, he said. 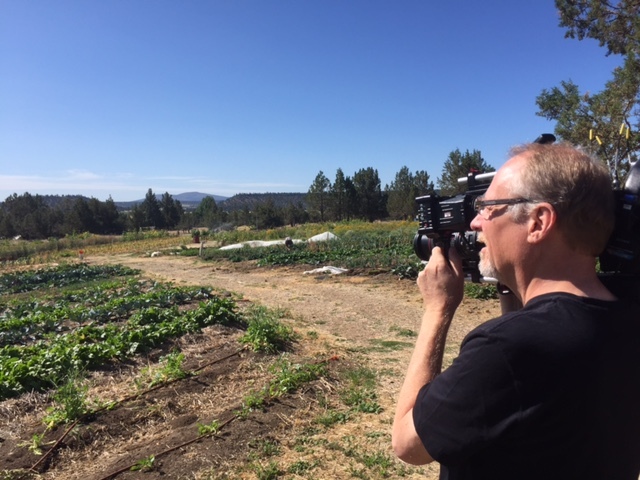 In late July, John filmed a future myWindow segment at the Rainshadow Organics farm in Terrebonne, where we were able to snag some behind-the-scene photos. Luckily, in this case, his cameraman was able to snag the necessary shots while John kept the farm dog occupied and someone else tended to the turkeys. As you can see, it’s no ordinary day in the office for this team. myWindow reporter Kerri Stewart spends her time lining up 10 different six-minute interviews that she films in one day each week. Though the Zolo group is currently working on reformatting and rebranding the news show, it’s clear that this talented team will continue to showcase the best of Central Oregon.